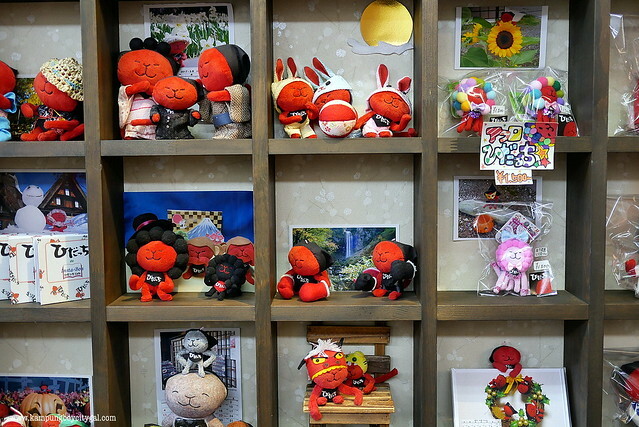 6D5N Takayama-Hokuriku Experience Itinerary & Transport Pass Tips HERE!! After spending half a day in Gifu City, we took a train to Takayama (高山), a city in the mountainous Hida region of Gifu prefecture. 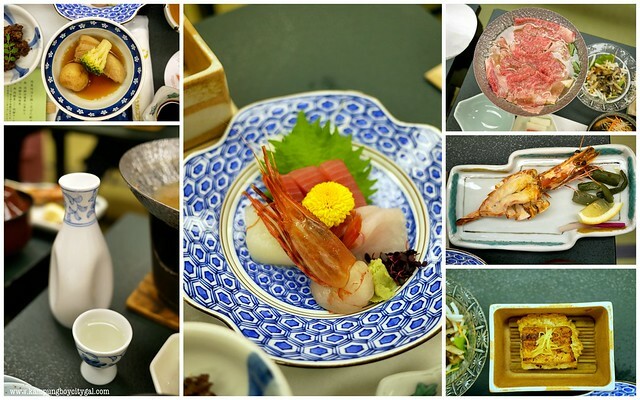 Takayama has acquired three stars in the Michelin tour guide book. 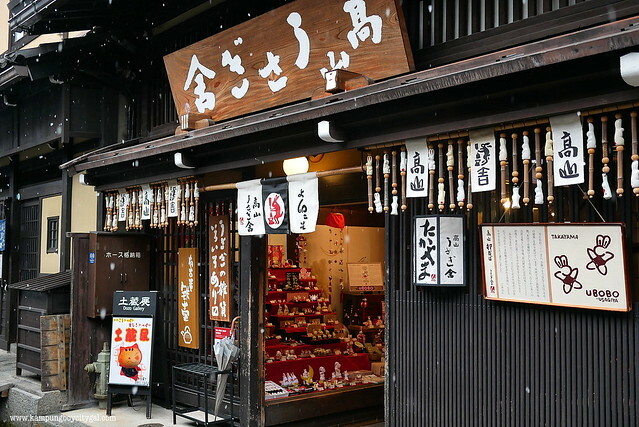 The main reason for this high rating is because Takayama retains a traditional touch, especially in its beautifully preserved old town (sanmachi) where wooden buildings from the Edo Period are still used as houses and shops. The good thing about Takayama is most of the attractions are located close to each other, so it is best to explore these places by foot. 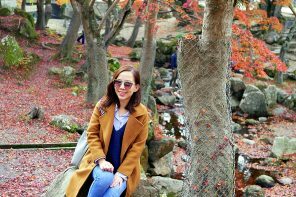 Having been to Takayama twice (once during autumn and once during winter), here’s my recommendations for top 8 things to do in Takayama. 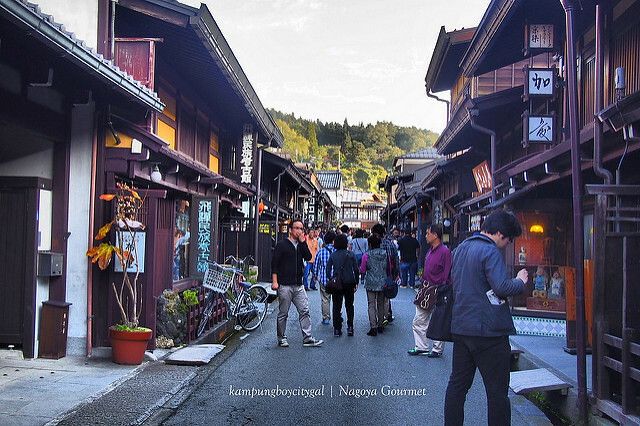 San-machi, the old streets, is the iconic district for sightseeing in Takayama. This merchant center was the prosperous heart of the community during the old castle town days. 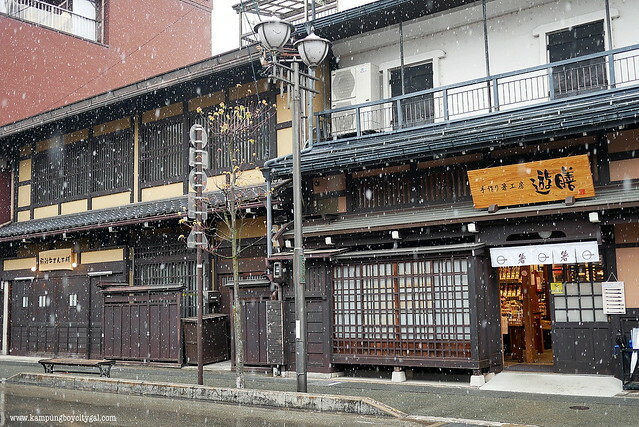 Many of the district’s restaurants and craft shops, along with sake breweries and old fashioned house cafes, use the original historic buildings. 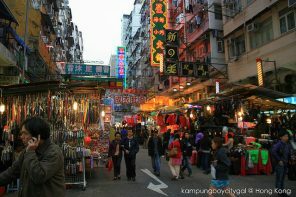 Be sure to explore some of these shops, not only to see the goods inside, but to appreciate the architecture as well. Free English tourist guide service is also available. More information here –http://www.hida.jp/english/practical-guide/introducing-our-free-english-tourist-guide-service. 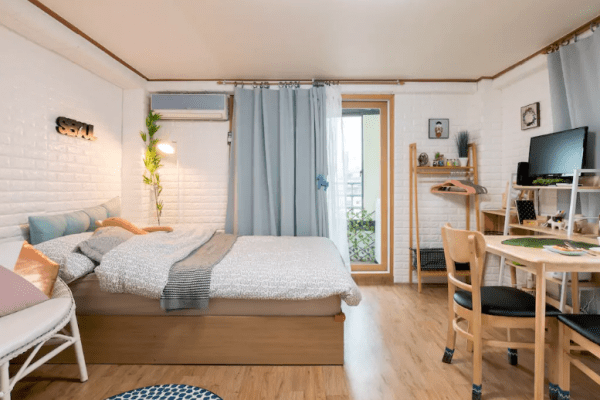 It is about 10 minutes walk from the bus station and tourist information centre. Takayama morning market is one of the biggest morning markets in Japan. 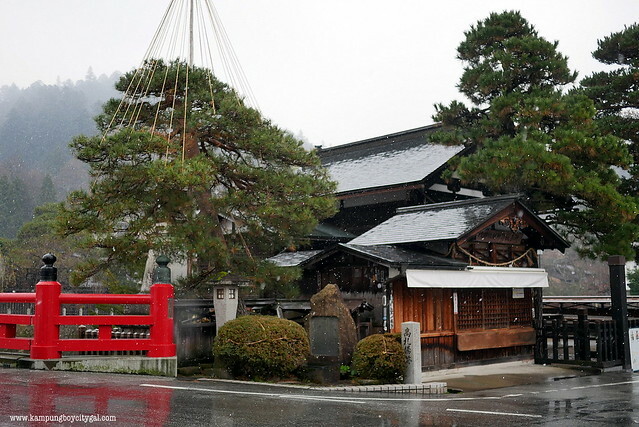 It takes place at two locations: One is held in front of the Takayama Jinya, and the other at the Miyagawa River side. 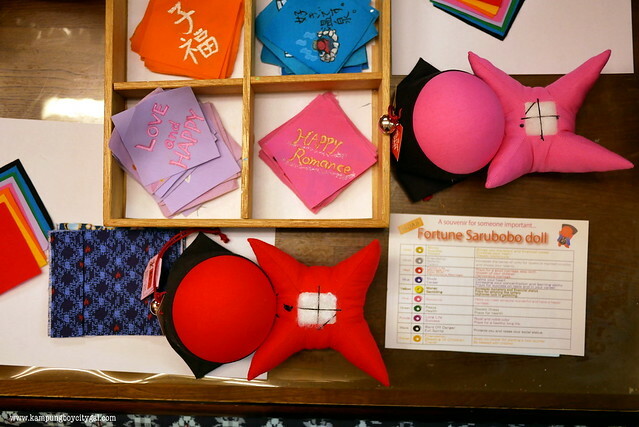 At the Miyagawa market, sixty shops and stalls are open in approximately 350 meters from Kaji bashi Bridge to Yayoi bashi Bridge along the Miyagawa River in the center of the town. 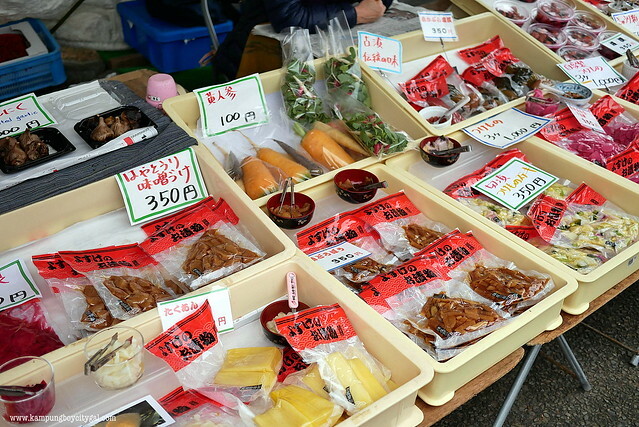 The stalls on river side sell vegetables, fruits, pickles and spices while shops on the other side sell Japanese sweets and crafts. 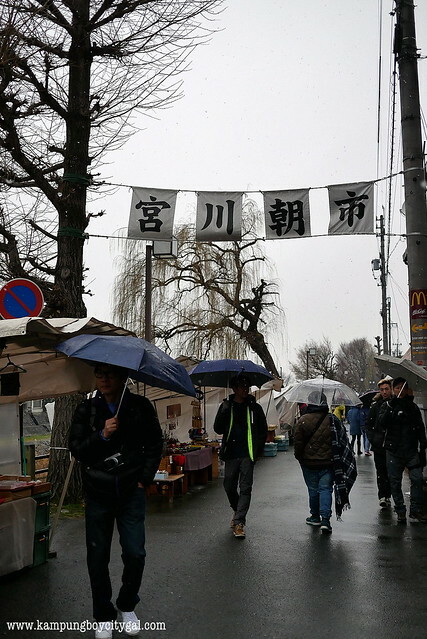 The Jinya-mae market started more than 300 years ago. 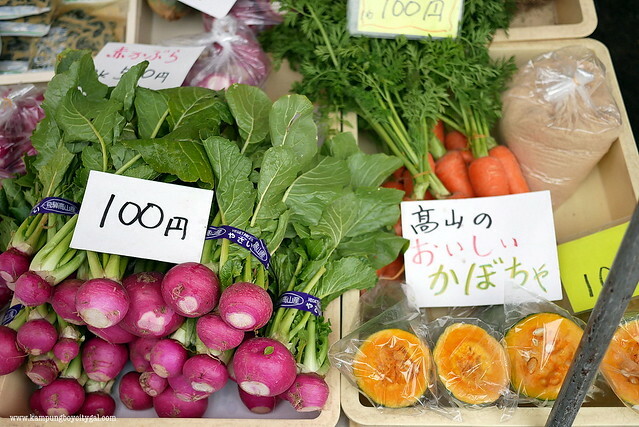 Many stalls sell fresh green vegetables, dried foods, and homemade pickles, and they are happy to tell you how to eat and to preserve their foods. 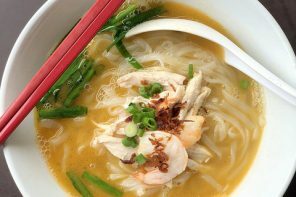 Unusual ingredients including stems of potato, carrot leaves and wild vegetables can be found. Both markets are open until almost noon. Personally I thin that Miyagawa Market is more interesting in terms of stall selections and food snacks. 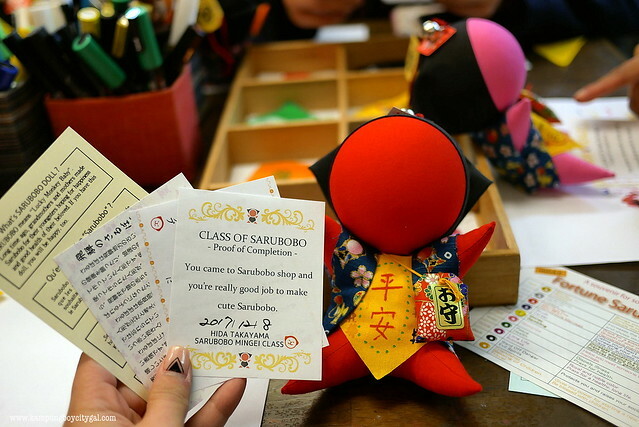 We tried our hands in making our very own Sarubobo (1,500 yen) and it was such a fun experience. .
Hida Takayama is famous for its Japanese sake. 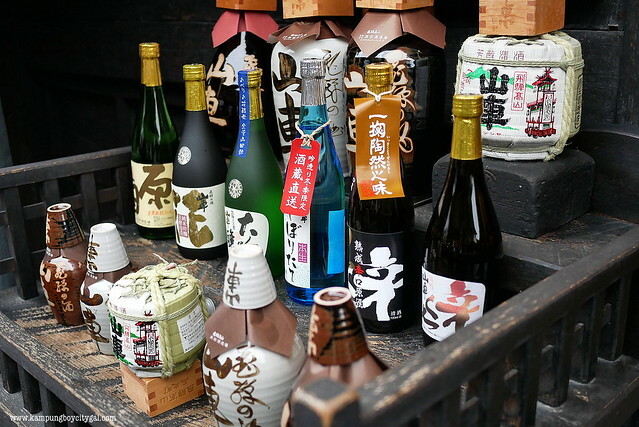 It is usually the colder regions of Japan like Hida Takayama that produce the best sake, because the microorganisms used for brewing sake work best at low temperatures. The area also has pure crystal clear mountain water which produces top quality rice necessary to make good sake. 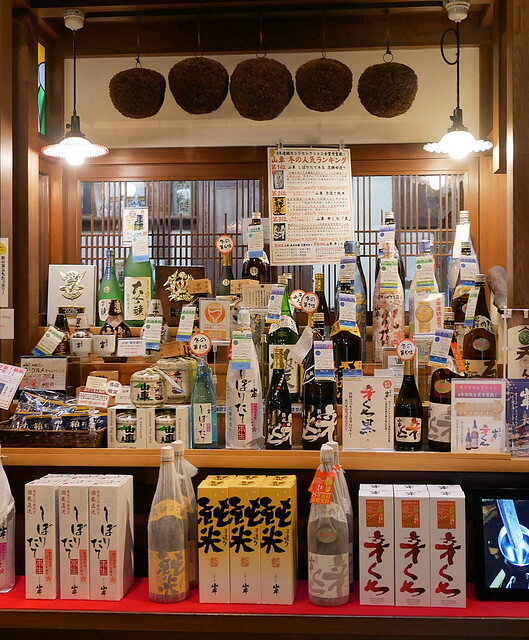 Identify a sake shop by looking for the traditional sake barrels called sakadaru, or sugidama, special balls made of cedar branches, that hang over the entrances. One of the highlights of my trip here is being able to sample every single one of the Sake being offered for only 200 Yen. 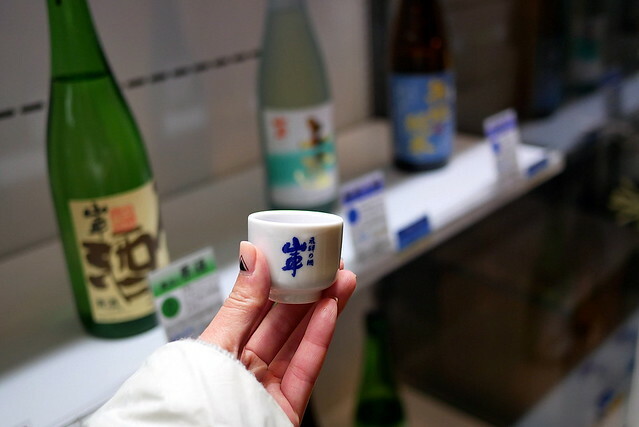 The little mug you receive in order to try the Sake is included in the price and can be taken home afterward as a souvenir. 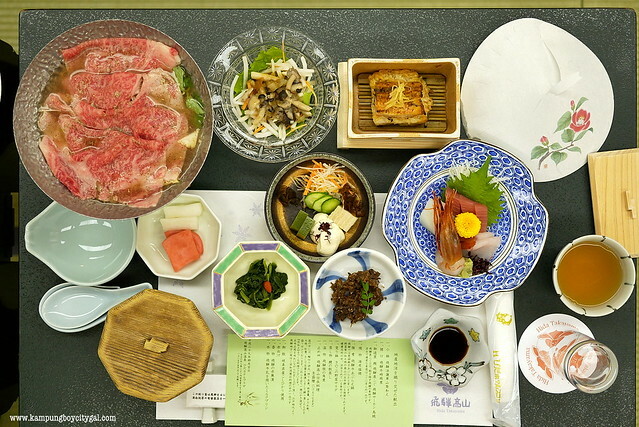 Hida beef is a famous type kuroge wagyu beef from the Gifu area in central Japan. 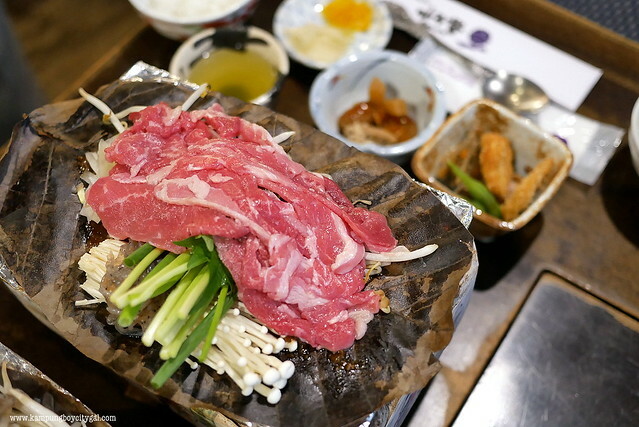 The beef is light and tender, with a beautiful marbling that produce a smooth and sweet flavor. Hida beef nigiri from Sakaguchiya. You can eat the senbei plate too. 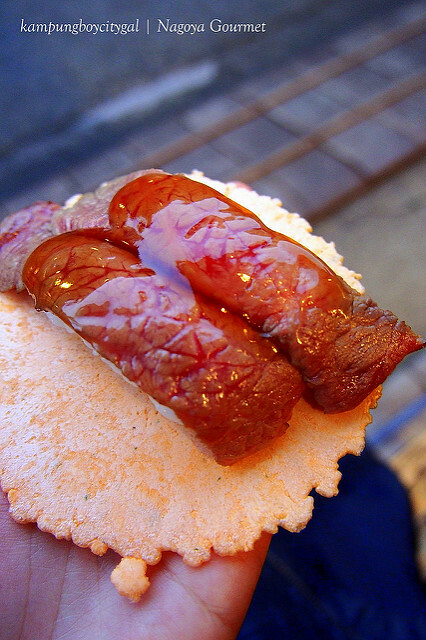 Remember to look out for this lightly seared Hida-Beef sushi (500 yen) along the sanmachi old street. Just spot for a long queue and you will be able to find it. 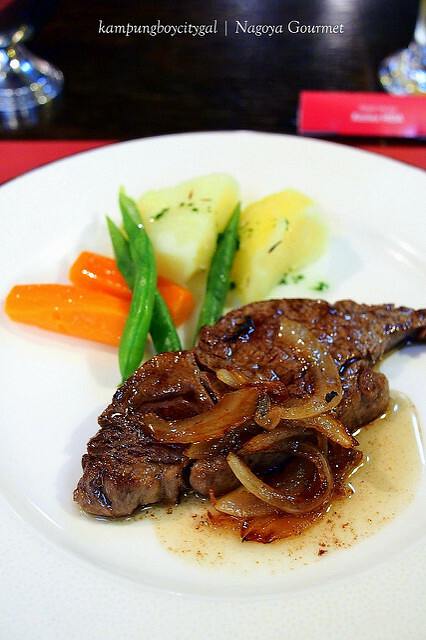 During my last visit, I tried Hida beef steak at Kitchen Hida – a prominent local steakhouse. The meat is prepared by the cook in front of you. Hida Beef kaiseki dinner at Hida Plaza Hotel. Hoba Miso is another specialty in Takayama. A magnolia leave is laid over a charcoal brazier or stove for roasting on it miso, onions, shiitake mushrooms, etc., with some oil. Eat it while it’s hot! It’s great as a snack with sake or a side dish. There are a few onsen hotels/ryokans in Takayama and we stayed at Hida Hotel Plaza. Soaking in their outdoor natural hot spring is an ideal way to relax. 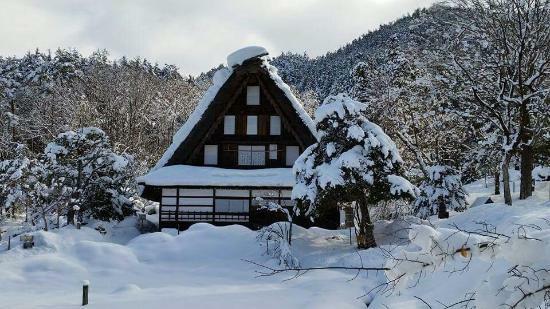 Okuhida Hot Springs Village is another famous attraction, well known for the five hot springs areas settled among the North Japan Alps. 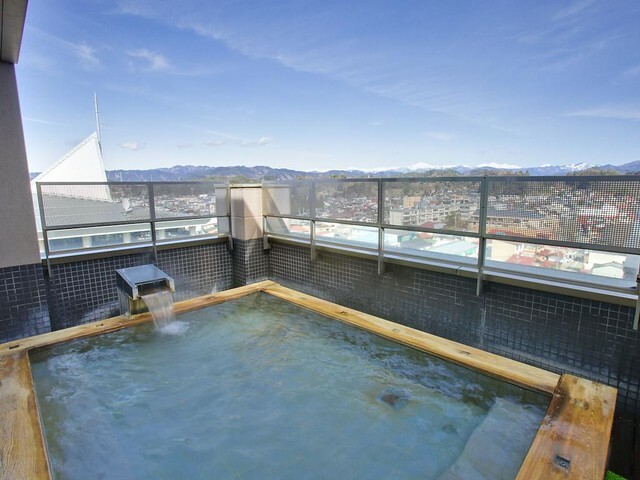 There are many hot spring inns to choose from, small and large, each with their own outdoor baths. 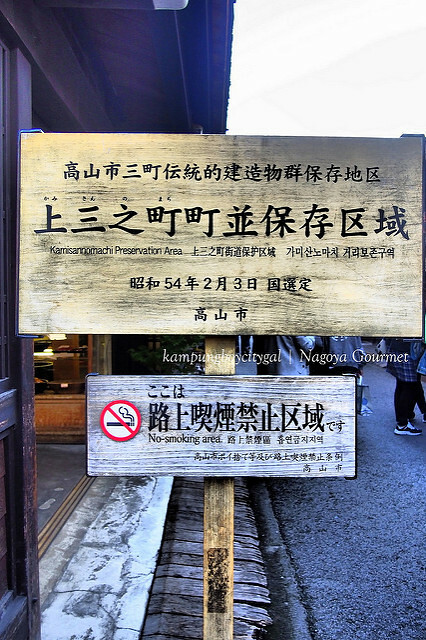 In total, there are over 140 outdoor hot spring baths in the area. The fee for entry to the baths ranges from 500 to 2,000 yen during the day, and visitors as well as lodgers are welcome to enjoy the baths. 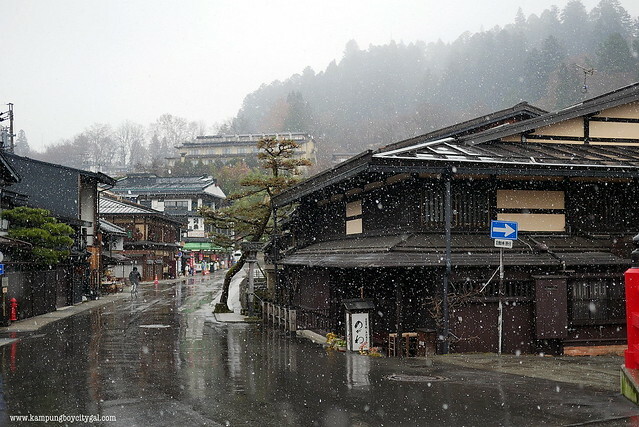 From the center of Takayama City, Okuhida Hot Springs Village is about one hour by bus. 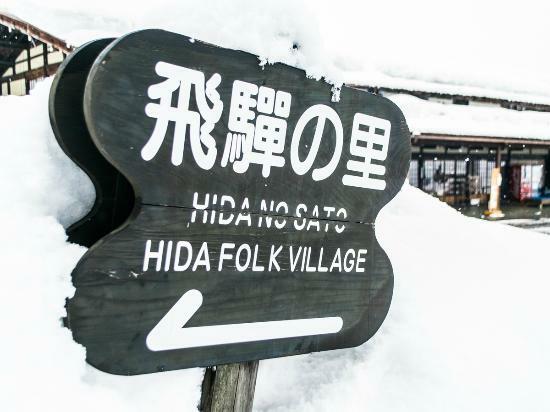 Hida Folk Village is an open air museum exhibiting over 30 traditional houses from the Hida region. The houses were built during the Edo Period (1603 – 1867) and were relocated from their original locations to create the museum in 1971. The Hida Folk Village is a 30 minute walk or 10 minute bus ride from Takayama Station in the opposite direction of the city center. The “Sarubobo Bus” provides connections every 20-40 minutes for 210 yen per ride or 620 yen for a one day pass. There is also a special discount ticket that combines the bus round trip from Takayama Station with admission to Hida no Sato for 930 yen.